Large, round, semi-flat variety, sweet with a hint of nutmeg. Fruit weighing up to 10kg. Sking turns golden brown when ripe. Australian variety. Vigorous vine produces bluish-green 6-10lb (2.5 - 4.5kg) fruits with deep ribbing. 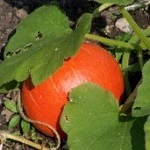 Also known as Uchiki Kuri or Onion Squash. Orange-scarlet fruits, tear-dropped shaped. Hubbard type. 4-7lb (2-3kg). 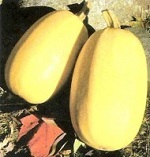 Trailing variety with fruits that look like marrow. Cook fruit whole and flesh becomes like spaghetti. Small 4" (10cm) cream and green striped fruits with a delicious nutty taste. Sweet potato type.